Amateur astronomers who on occasion observe Mars through the eyepiece of their telescopes are quite familiar with the region of Syrtis Major; when observing conditions are good, it can be easily identified as a dark spot on Mars. This large volcanic region just north of Mars' equator covers an area of roughly 1300 by 1500 kilometres - about half the size of Europe. 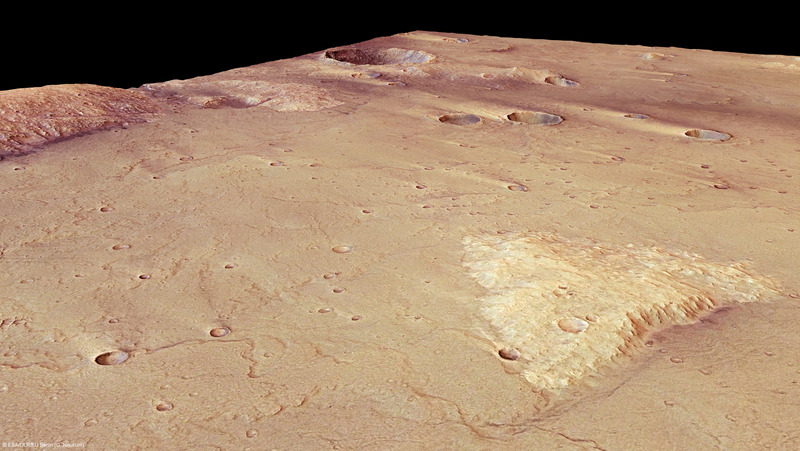 The High Resolution Stereo Camera (HRSC), operated by the German Aerospace Center (Deutsches Zentrum für Luft und- Raumfahrt; DLR), on board ESA's Mars Express spacecraft imaged a 90 by 180 kilometre section of Syrtis Major at a resolution of about 19 metres per pixel during orbit 9487 on 8 June 2011. Syrtis Major was first observed in 1659 by the Dutch mathematician, physicist and astronomer Christiaan Huygens (1629-1695), who was also the first to recognise Saturn's rings. The pronounced dark colouring of the region allowed Huygens to determine Mars' rotation through the change in position of Syrtis Major in the course of his telescopic observations; he was thus able to, for the first time, estimate the length of the planet's day - and he did so relatively precisely, arriving at a value of 24.5 hours (in fact it is 24 hours and 37 minutes). The name Syrtis Major is derived from the Roman name for the Gulf of Sidra on the coast of Libya. At present, Mars is once again approaching opposition to Earth; on 2 March 2012 the Sun, Earth and Mars will be in a straight line with Earth in the middle. Mars will rise in the east immediately after sunset and stand high in the southern sky at midnight. It is not, however, a very favourable opposition for astronomers because, due to its highly elliptical orbit, Mars will be at its furthest point from the Sun in March. As a result, the distance between Earth and Mars will be 100.8 million kilometres; during opposition on 28 August 2003 they were only 55.8 million kilometres apart, their closest approach for nearly 60.000 years. 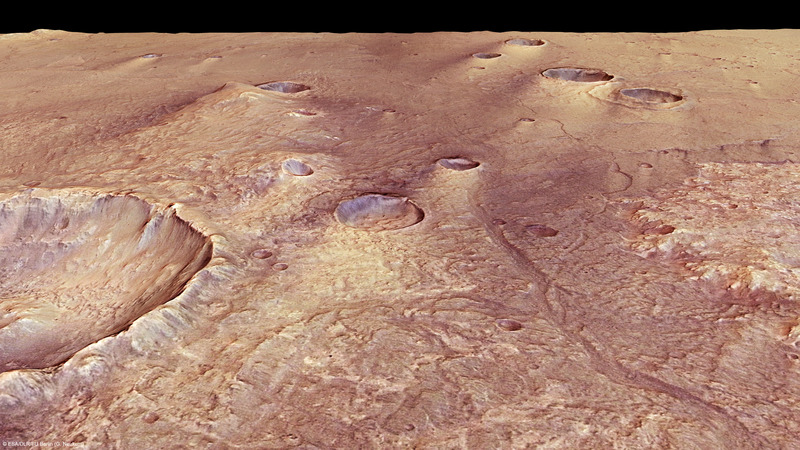 The images shown here were produced by the Department of Planetary Sciences and Remote Sensing at the Institute for Geological Sciences of the Freie Universität Berlin, using HRSC image data systematically pre-processed by DLR. They show a section of Syrtis Major at 16 degrees north and 73 degrees east. Visible on the general image map are volcanic lava flows that flooded the older highland material, leaving mesas (flat-topped mountains) behind. These can be easily distinguished from their surroundings due to their lighter colouring. The flow fronts of the individual solidified lava flows resemble lobe-shaped lines with some irregularities (image box 1); in the anaglyph image they are revealed as subtle height differences. 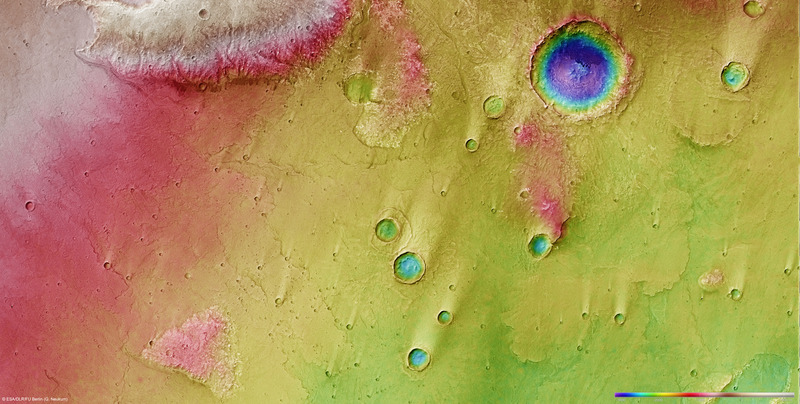 Some impact craters in the region were partially or completely filled with volcanic material. One large impact crater with a diameter of about 18 kilometres was filled almost to the top by low-viscosity lava; the circular outline is barely visible through the more recent lava cover (image box 2). Finally, the landscape was shaped by the force of the wind. Here the prevalent wind direction, at least in the more recent past, from east-southeast can be derived by means of the lighter aeolian deposits to the sides of the smaller impact craters sheltered from the wind. The largest impact crater in the area shown here (image box 3) has a diameter of about 20 kilometres with a small mountain at its centre. 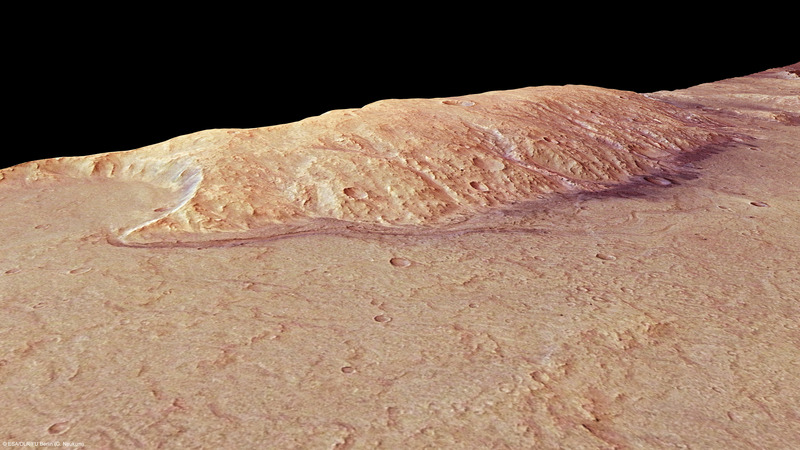 West of this central mountain (above it in the image) is a small, dark field of dunes. In particular, the dunes at the front here nearly mimick the 'perfect shape' of typical sickle-shaped dunes, or barchans, common in deserts on Earth. 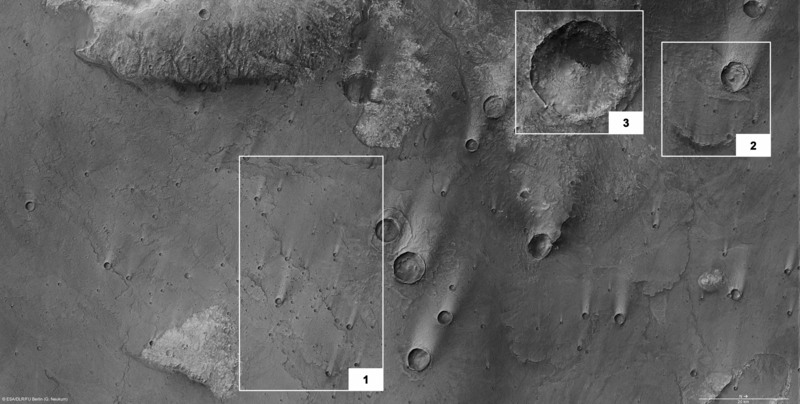 Another noticeable feature is that the older impact craters are found in the old highlands (in the upper half of the perpendicular views). 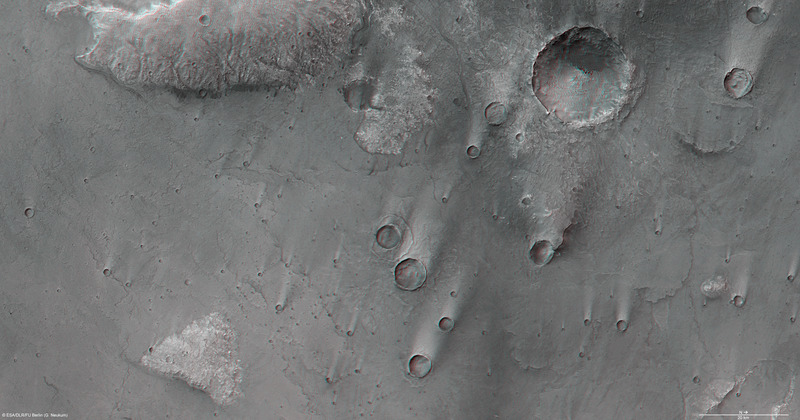 In contrast, only smaller impact craters can be found on the younger volcanic surface in the lower half of the image. 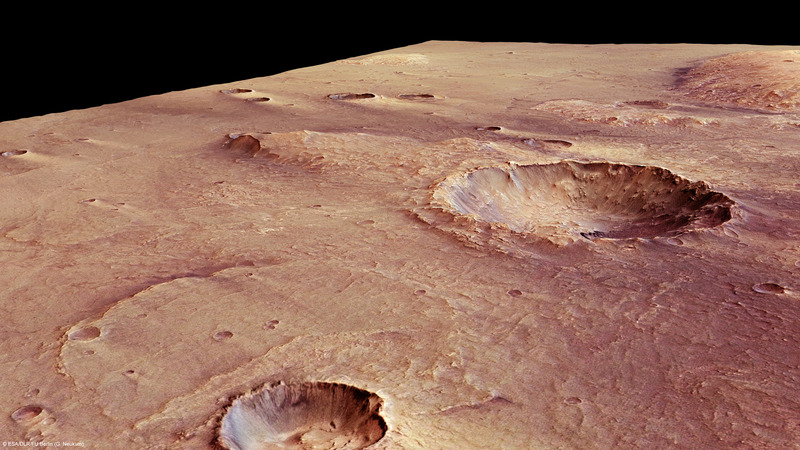 Dating by means of the crater size-frequency distribution reveals that the surface is of Hesperian age: in Mars' geological history this period, characterised by widespread volcanic activity, corresponds to about 3.7 to 3 billion years ago. 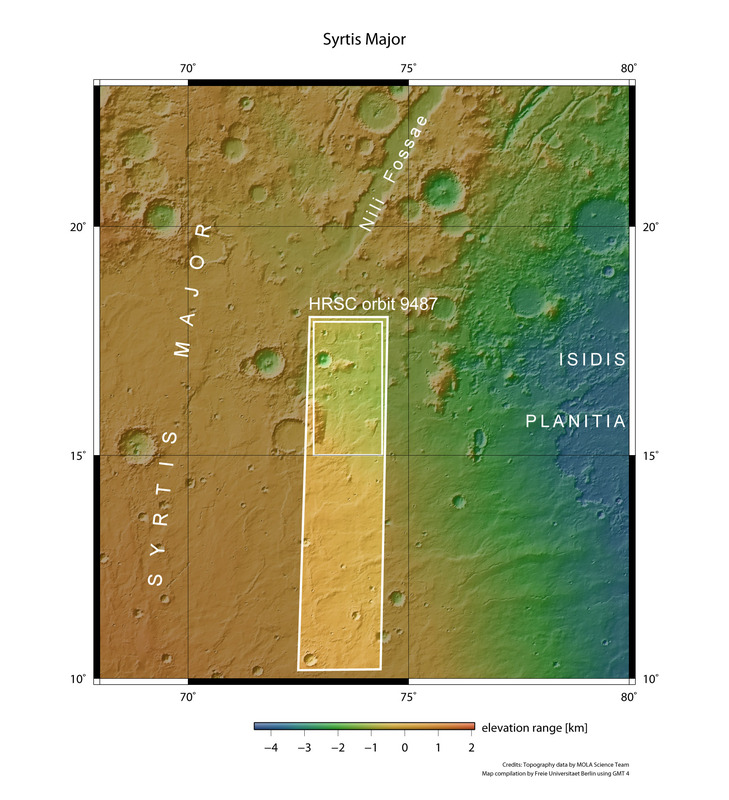 The colour images were created from the nadir channel, the field of view of which is aligned perpendicular to the surface of Mars, and the colour channels; the oblique perspective views were generated from HRSC stereo channel data. The anaglyph, which creates a three-dimensional impression of the landscape when viewed with red/blue or red/green glasses, was derived from the nadir channel and one stereo channel. The black-and-white image is based on data acquired by the nadir channel, which has the highest resolution of all the channels. The colour-coded plan view is based on a digital terrain model of the region, from which the topography of the landscape can be derived. operated by the DLR Institute of Planetary Research in Berlin-Adlershof, through ESA/ESOC. The systematic processing of the HRSC image data is carried out at DLR. The images shown here were created by PI-group at the Institute of Geological Sciences of the Freie Universität Berlin.